This document provides details on how to create custom codes. Click Settings in the upper right corner of the page. 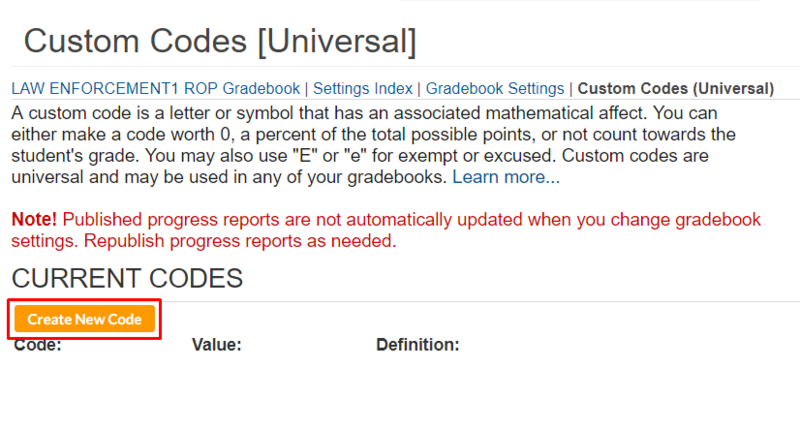 Choose a Gradebook under Gradebook Settings. In the Custom Codes (Universal) section, click Go. Enter the code in the in the appropriate field field (e.g., 'I'). Enter the explanation of the code in the Definition field (e.g., 'Incomplete'). Choose the appropriate Value (e.g., 'Zero'). Code: This is the value you will enter as a score. Custom codes are not case sensitive and should be 3 or fewer characters-long, since that's all that will be visible in the cells where the scores are entered. It is not advisable to use numbers unless when combined with other character types. Definition: Brief and plain explanation of the code. Value: Choose a type. If you choose Percent, you must also enter a numerical value in the Percent input field. Otherwise, choose either Does Not Count or Zero. The created custom code will be displayed under the Current Codes list and the teacher can use that code in the Gradebook.